The column draft beer tower design is simple, cost effective and visually appealing. The towers range from 3" to 4" with glycol and air cooling options. It also has several tap options, ranging from one to four faucets per column. 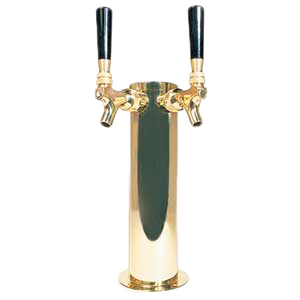 The column draft beer design also comes in polished stainless steel or PVD brass to match your bars aesthetic needs. 4" Column Draft Beer Tower with 3 Faucets. Made of PVD Brass & Glycol Cooled. Constructed of high grade stainless steel and plated with PVD Brass that is tarnish and scratch resistant, this draft beer tower is designed to look good and last! This beer tower is gylcol cooled with Kool-Rite technology and patented cooling blocks as well as leak proof shanks. It is NSF certified as well. 3" Column Draft Beer Tower with 2 Faucets. Made of PVD Brass & Glycol Cooled. 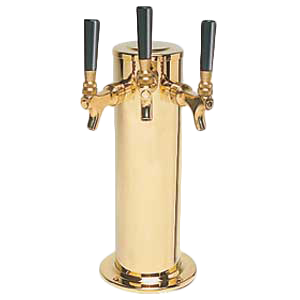 Constructed of high grade stainless steel and plated with PVD Brass that is tarnish and scratch resistant, a stainless steel faucet lever and chrome plated bonnet, shaft and collar, this draft beer tower is designed to look good and last! This tower is gylcol cooled with Kool-Rite technology and NSF certified.